What two things are crucial for a correct mapping? Sequencing produces a collection of sequences without genomic context. We do not know to which part of the genome the sequences correspond to. Mapping the reads of an experiment to a reference genome is a key step in modern genomic data analysis. With the mapping the reads are assigned to a specific location in the genome and insights like the expression level of genes can be gained. The short reads do not come with position information, so we do not know what part of the genome they came from. We need to use the sequence of the read itself to find the corresponding region in the reference sequence. But the reference sequence can be quite long (~3 billion bases for human), making it a daunting task to find a matching region. Since our reads are short, there may be several, equally likely places in the reference sequence from which they could have been read. This is especially true for repetitive regions. In principle, we could do a BLAST analysis to figure out where the sequenced pieces fit best in the known genome. We would need to do that for each of the millions of reads in our sequencing data. Aligning millions of short sequences this way may, however, take a couple of weeks. And we do not really care about the exact base to base correspondence (alignment). What we are really interested in is “where these reads came from”. This approach is called mapping. In the following we will process a dataset with the mapper Bowtie2 and we will visualize the data with the program IGV. As default, Galaxy takes the link as name, so rename them. We just imported in Galaxy FASTQ files corresponding to paired-end data as we could get directly from a sequencing facility. During sequencing, errors are introduced, such as incorrect nucleotides being called. Sequencing errors might bias the analysis and can lead to a misinterpretation of the data. The first step for any type of sequencing data is to check their quality. The quality control tutorial is explaining this step. We will not going into the details here, in particular for the parameters. Figure 1: Illustration of the mapping process. The input consists of a set of reads and a reference genome. It the middle, it gives the results of mapping: the locations of the reads on the reference genome. The first read is aligned at position 100 and the alignment has two mismatches. The second read is aligned at position 114. It is a local alignment with clippings on the left and on the right. The third read is aligned at position 123. It consists of a 2-base insertion and a 1-base deletion. We need a reference genome to map the reads on. What is a reference genome? For each model organism, several possible reference genomes may be available (e.g. hg19 and hg38 for human). What do they correspond to? Which reference genome should we use? 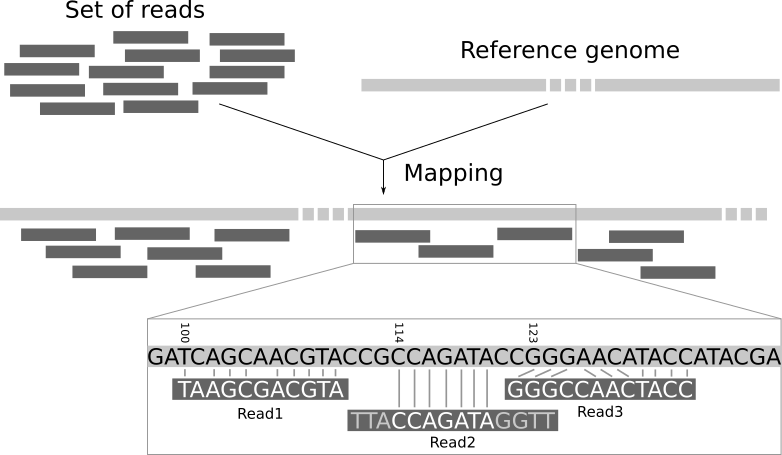 A reference genome (or reference assembly) is a set of nucleic acid sequences assembled as a representative example of a species’ genetic material. As they are often assembled from the sequencing of different individuals, they do not accurately represent the set of genes of any single organism, but a mosaic of different nucleic acid sequences from each individual. As the cost of DNA sequencing falls, and new full genome sequencing technologies emerge, more genome sequences continue to be generated. Using these new sequences, new alignments are builts and the reference genomes improved (fewer gaps, fixed misrepresentations in the sequence, etc). The different reference genomes correspond to the different released versions (called “builds”). This data comes from ChIP-seq of mices, so we will use mm10 (Mus musculus). Currently, there are over 60 different mappers, and their number is growing. In this tutorial, we will use Bowtie2, a fast and memory-efficient open-source tool particularly good at aligning sequencing reads of about 50 up to 1,000s of bases to relatively long genomes. You should have a look at the parameters there, specially the mate orientation if you know it. They can improve the quality of the paired-end mapping. You should have a look at the non default parameters and try to understand them. They can have an impact on the mapping and improving it. What information is provided here? How many reads have been mapped exactly 1 time? How many reads have been mapped more than 1 time? How is it possible? What should we do with them? How many pair of reads have not been mapped? What are the causes? The information given here is a quantity one. We can see how many sequences are aligned. It does not tell us something about the quality. ~7% reads have been aligned concordantly >1 times. These are called multi-mapped reads. It can happen because of repetitions in the reference genome (multiple copies of a gene for example), specially when the reads are small. It is difficult to decide where these sequences come from so most pipelines ignores them. Always check the statistics there to be sure of not removing to much information by discarding them in any downstream analyses. Polymerase Chain Reaction (PCR) artifacts: Many HTS methods involve one or multiple PCR steps. PCR errors will show as mismatches in the alignment, and especially errors in early PCR rounds will show up in multiple reads, falsely suggesting genetic variation in the sample. A related error would be PCR duplicates, where the same read pair occurs multiple times, skewing coverage calculations in the alignment. Sequencing errors: The sequencing machine can make an erroneous call, either for physical reasons (e.g. oil on an Illumina slide), or due to properties of the sequenced DNA (e.g., homopolymers). As sequencing errors are often random, they can be filtered out as singleton reads during variant calling. Mapping errors: The mapping algorithm can map a read to the wrong location in the reference. This often happens around repeats or other low-complexity regions. So if the mapping statistics are not good, you should investigate the cause of these errors before going further in your analyses. After that, you should have a look at the reads and inspect the BAM file where the read mappings are stored. A BAM (Binary Alignment Map) file is a compressed, binary file storing the sequences mapped to a reference sequence. Which information do you find in a SAM/BAM file? What is the additional information compared to a FASTQ file? So the BAM file integrates many information for each read, in particular the quality of mapping. Which proportion of mismatches are in the mapped reads when aligned to the reference genome? What does the error rate represent? What is the average quality? How is it represented? What is the insert size average? How many reads have a mapping quality score below 20? The insert size is the distance between the two reads in the pairs. 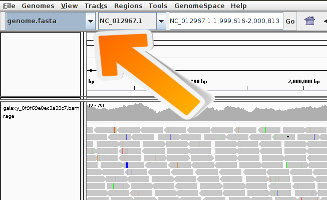 The Integrative Genomics Viewer (IGV) is a high-performance visualization tool for interactive exploration of large, integrated genomic datasets. It supports a wide variety of data types, including array-based and next-generation sequence data, and genomic annotations. In the following we will use it to visualize the mapped reads. What could it mean if a bar in the coverage view is colored? What could be the reason why a read is white instead of grey? If a nucleotide differs from the reference sequence in more than 20% of quality weighted reads, IGV colors the bar in proportion to the read count of each base. They have a mapping quality equal to zero. Interpretation of this mapping quality depends on the mapping aligner as some commonly used aligners use this convention to mark a read with multiple alignments. In such a case, the read also maps to another location with equally good placement. It is also possible the read could not be uniquely placed but the other placements do not necessarily give equally good quality hits. Because the number of reads over a region can be quite large, the IGV browser by default only allows to see the reads that fall into a small window. This behaviour can be changed in the IGV from view > Preferences > Alignments. After quality control, mapping is an important step of most analyses of sequencing data (RNA-Seq, ChIP-Seq, etc) to determine where in the genome our reads originated from and use this information for downstream analyses. This material is the result of a collaborative work. Thanks to the Galaxy Training Network and all the contributors ( Joachim Wolff, Bérénice Batut)!